We offer both wet spray and powder coating processes, so whether your parts are large or small, wet sprayed or powder coated, we've got you covered. 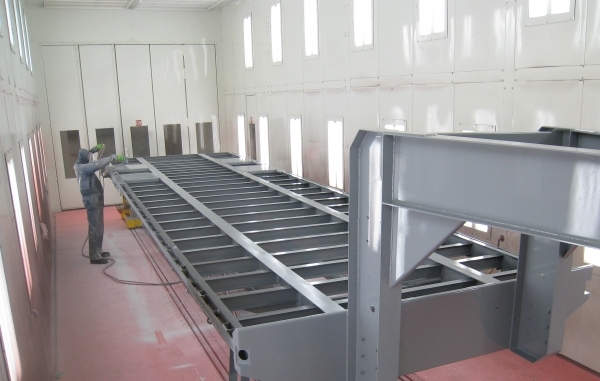 The finishing process begins in our 60 foot wash bay where all metal parts are prepped for paint with a multi-stage cleaning and iron phosphate chemical etch, rinse and sealer that assures a tight bond of the finish coating. We typically coat all bolt together components prior to assembly to assure thorough coverage including hidden areas, adding increased protection from corrosion causing elements. Items smaller than 20 feet are typically powder coated, while larger parts up to 60 feet – are wet sprayed. Our state of the art coating booths provide a well lit and filtered paint application environment. Combined with skilled painters, this allows us to deliver an exceptionally high quality, durable finish that’s sure to improve your image.